In the Signup Forms screen that appears, under Mailing List choose the necessary list. 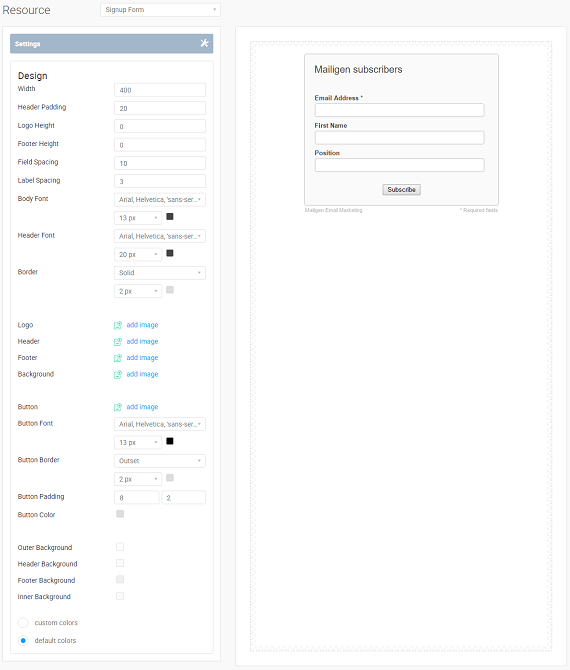 After you have selected the Signup Form you can make changes to the behaviour or design of your form through the Resource Settings section or the Design Settings section. 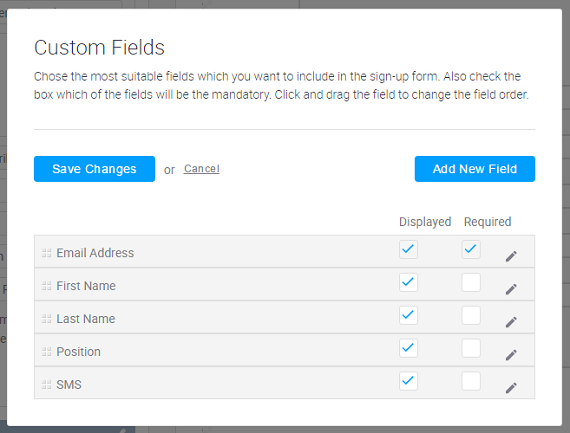 For more information about other signup form types, see Customize Other Web Forms. Title. Type in a title that will be visible on your homepage. It is recommended you choose an informative title, for example, Today’s Sports Roundup. Button. The label that will appear on the button in the signup form. Type in an action word that tells the subscriber what to do to sign up. “Subscribe” or “Join” is appropriate! Button position. Select the position of the button: left, centre, or right. Label. Defines the position of the Email Address, First Name, and Last Name field labels, relative to their fields. Language. The language of the form. Text Direction. Select the direction of the text: left to right, right to left. Note: Check how the changes you make are reflected in the web page mock-up on the right-hand side of the screen. Note: Editing fields is covered in more detail under the “List And Form Field Types” support topic. You can only edit custom fields. When you are done editing the fields, click the Save Changes button to confirm the changes. This section provides multiple options to make the sign-up form more pleasing to the eye.